Since taking over vacant possession of our new home in Shah Alam, we’ve been spending quite a bit of time inspecting defects and monitoring the construction of koi pond version 2. 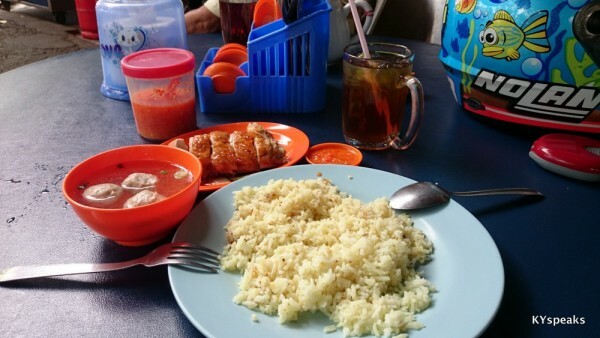 With the new place just a stone’s throw away from Klang toll, we’ve started exploring the eateries nearby, such as the few rows of old school restaurants and kopitiam at Taman Berkeley, an area that’s already a favorite among the locals. When trying out a new place, the rule of thumb is just stick with the most popular option. 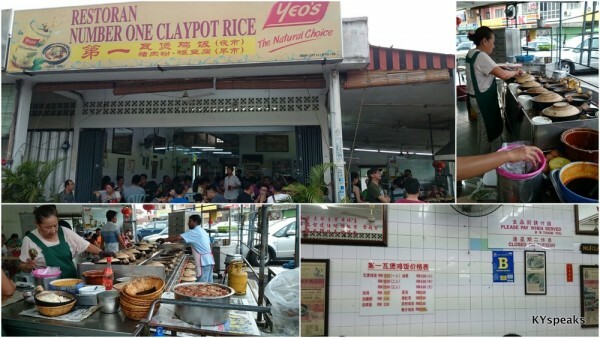 In a kopitiam, the most popular stall, and in a makan area like Berkeley, the restaurant that’s most packed. 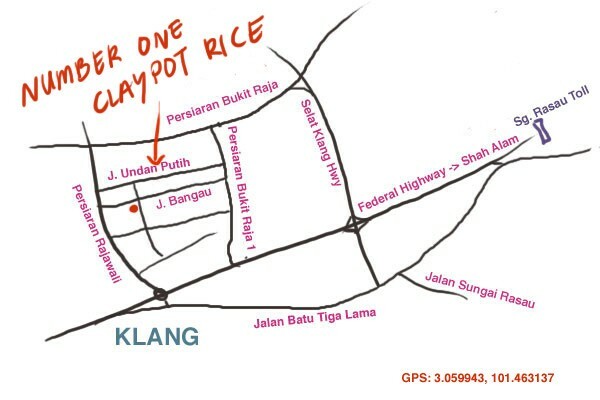 Going with this rule brought us to Number One Claypot Rice, a restaurant that isn’t really overly humble on their claim. 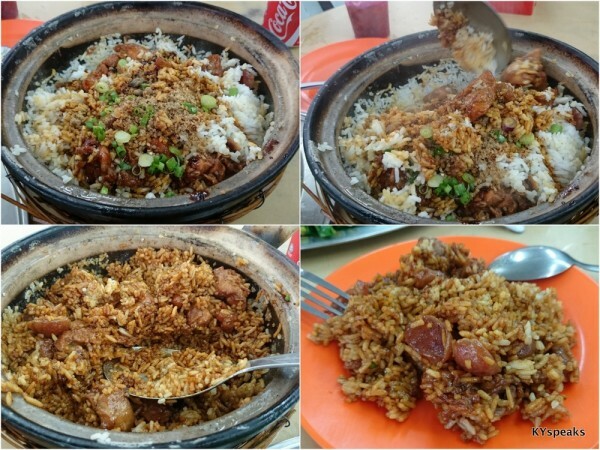 Like most claypot chicken rice places, the rice is cooked from scratch claypots of two sizes. 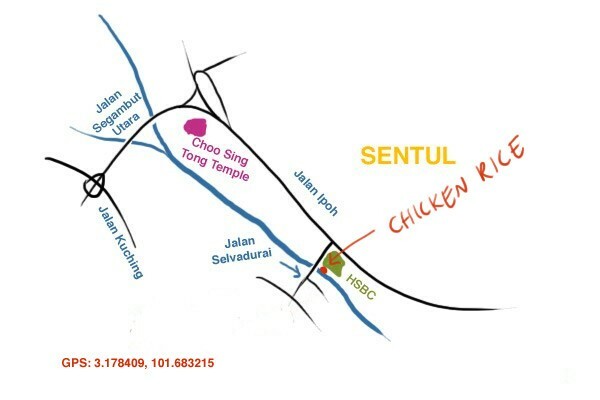 A single portion is priced at RM 7, and bigger, double person portion at RM 14. If there’s 5 of you, 2 big and 1 small, you do the math, it’s pretty simple. In the pot you get plenty of bite size chicken, chunks of lap cheong (Chinese wax sausage), and a small amount of salted fish. 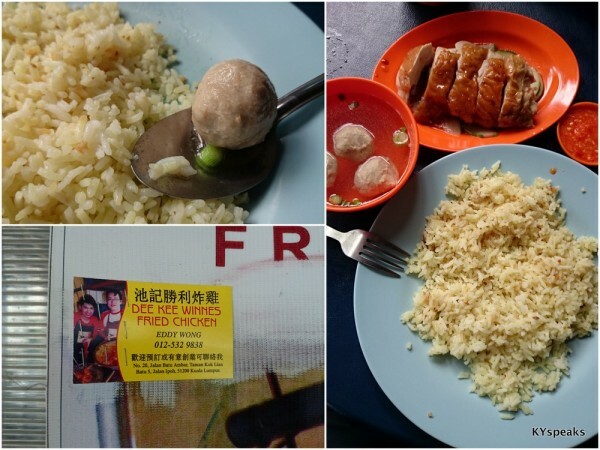 I find the rice and chicken pretty much spot on, with the sausage having slightly tougher skin that I’d like, and the salted fish, well, is something that I’ll need to ask for extra the next time around (you can do that for extra RM 2). The crispy bits of charred rice are there for those who love it that way. To compliment the claypot chicken rice, we also ordered the coconut chicken soup (RM 7) and a side of braised vegetable (RM 5), there’s also option of herbal chicken soup, vegetable soup, or pork tripe soup (would be better I think!) to go around as well. 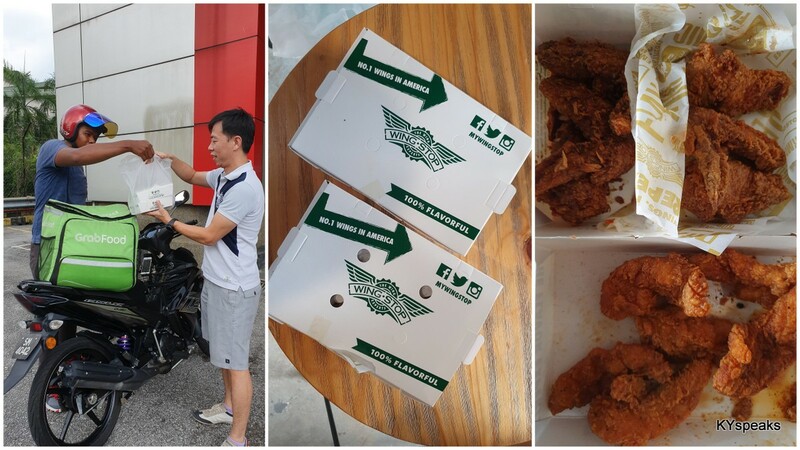 Everything came to be about RM 30 for the two of us, and the serving was certainly more than enough. Would go back again. 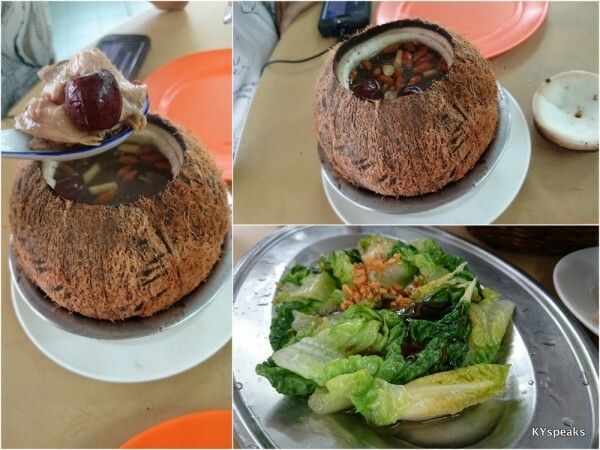 A couple weeks ago we had yet another “you’ve got bonus so you have to belanja” session with my colleagues, and this time around our destination was Puti Bungsu Batam at the nearby Lorong Yap Kwan Seng, which technically is close enough you can walk to from KLCC, but obviously we drove there. 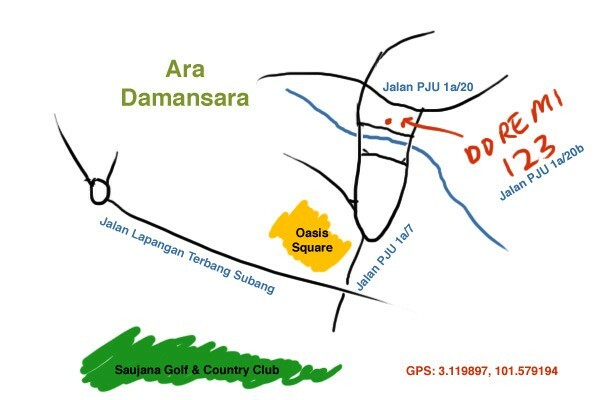 The restaurant is visible from Jalan Yap Kwan Seng itself, and located just a stone’s throw away from the Las Vacas. It is also clean, airy, and has a simple yet somewhat tasteful decoration. Oh, the parking lot is good enough for perhaps half a dozen cars, get there early if you drive. 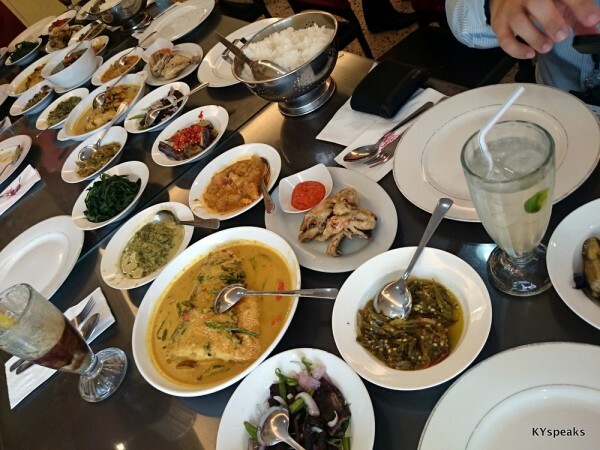 Puti Bungsu claimed to serve Authentic Padang food, and they have quite a big selection of dishes. 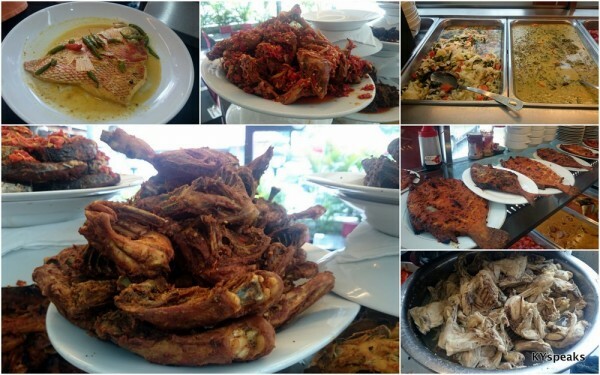 There’s ikan bakar, a few types of ayam (including their famous ayam pop), kepala ikan, tunjang (beef tendon), and more. Additionally, they also have a relatively big menu on drinks, and like any self respecting Indonesian restaurant, they have jus alpukat (avocado + chocolate), which is a must-order for me! For the nine of us, we ordered up quite a feast. We had tunjang, fish head curry, daging salai (smoked beef), sambal cili (green chili sambal), ayam bob, terung (brinjal), and some vege. All these to go with steamed rice, since we’re after all, Asian. The dishes were pretty good actually, apart from daging salai which I thought was slightly too tough to chew on. The tunjang almost as good as the version at Kampung Baru. We really liked it. 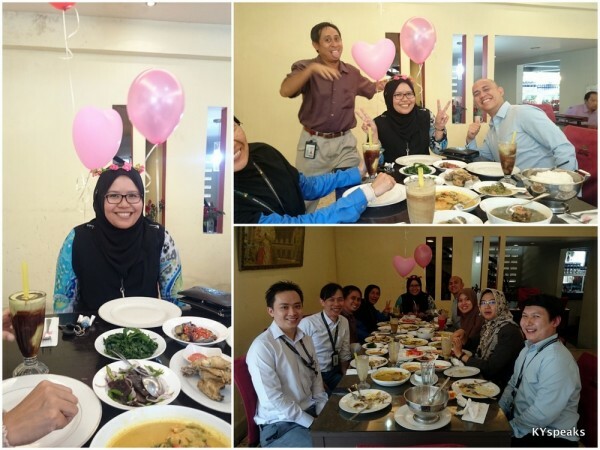 According to Syeka, the colleague who belanja all of us, the meal turned out to be almost RM 40 per pax, inclusive of some pretty fancy drinks we had. 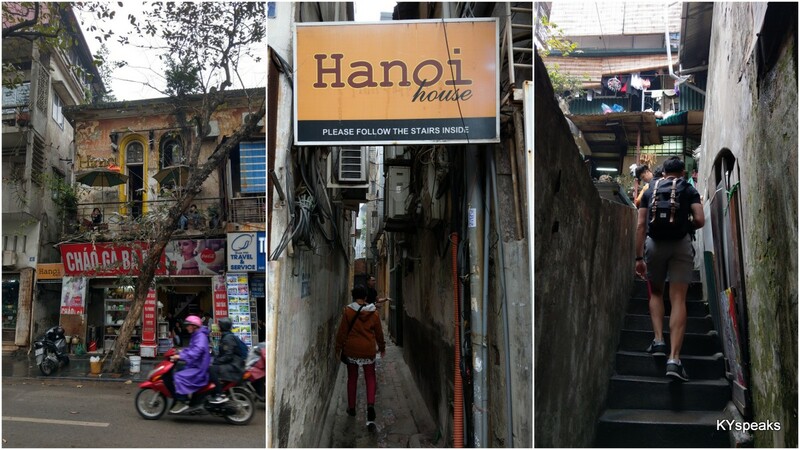 It’s definitely not cheap, but for the ambiance and location, not out of expectation. 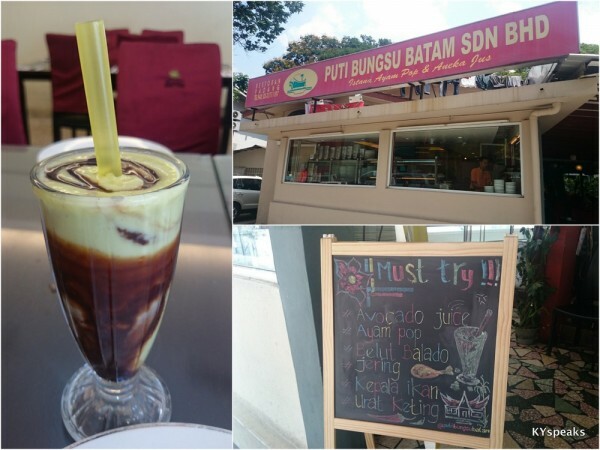 Puti Bungsu is certainly a pretty decent place for a bit of a get-together, and one that happens to serve good, authentic Padang food. We enjoyed it. For the past one year plus, I visit MyDentist pretty much every other week for my invisalign treatment, and every now and then, I do ask the good people in the clinic for lunch suggestions at and around Jalan Ipoh area. 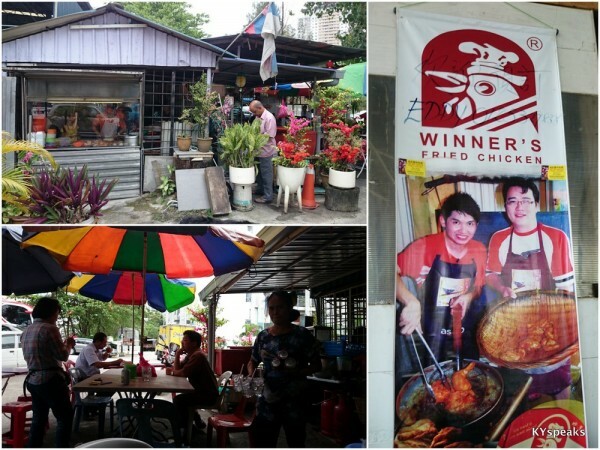 A couple weeks ago, I was introduced to this nameless chicken rice stall that I think worth mentioning here. 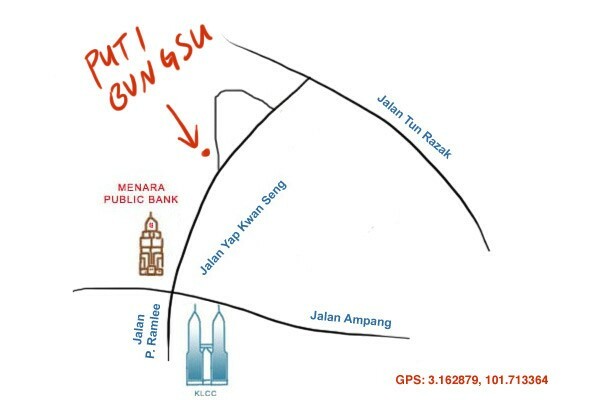 The stall is located pretty much right behind HSBC, just opposite Aeon Big entrance and right beside the river. There’s no name and it is more like a make shift shelter than a proper shop, though there’s fans, lights, and plenty of tables. I had the roast chicken with a side of pork balls here, but like most chicken rice stalls, they also have roast pork, charsiu, and steamed chicken. The chicken really juicy and succulent, and those pork balls (wished I ordered more) really hit the spots. 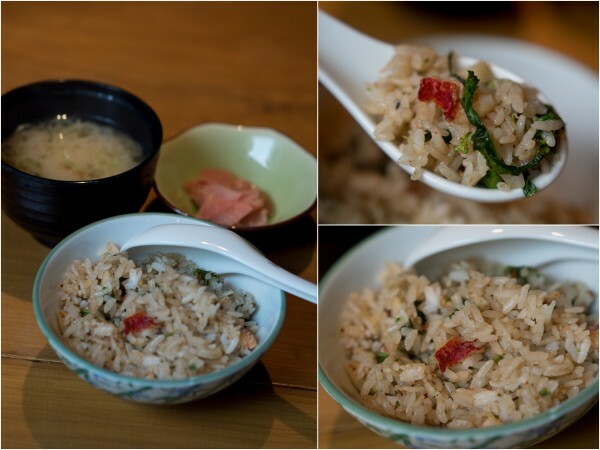 The rice too was rather fragrant and best of all, the chili was one of the best I’ve tried. Spicy, aromatic, and really brings out the flavor of the chicken and pork ball. I will go back here just for the chili alone. With drinks, this was less than RM 10, and I was properly satisfied. I have a feeling I will be back here again pretty soon. Sometimes all you need is some simple comfort food, and for me, sometimes that comes in the form of a bowl of good bitter gourd noodle soup. While running around trying to sort of stuff for our new home and somehow missed lunch in the process, I found myself at around Ara Damansara, and recalled that someone mentioned once about a stall at Restoran Do Re Mi 123 that offers bitter gourd soup, so I took the turn to investigate. 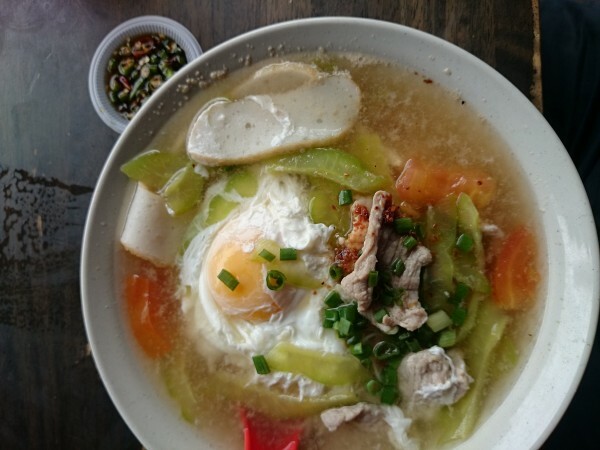 Restoran Do Re Mi 123 is a medium size kopitiam located at the “busiest” commercial centre in Ara Damansara on an island surrounded by major roads going in and out of the residential area. Parking is usually not too challenging, and the restaurant offers quite a selection of different hawker fair that any KL folks will be familiar with. The noodle soup stall offers bitter gourd noodle, pork noodle, fish ball noodle soup, and “imperial” noodle. For RM 5 you get a bowl of soup with your choice of noodle (I choose mee suah) laden with reasonable amount of pork slices, fish cake, bitter gourd, and even tomato. It was quite well balanced and not overly salty. Another RM 1 gets you an egg just to make it closer to a balanced meal. A simple comfort food I don’t mind having a couple times a week. 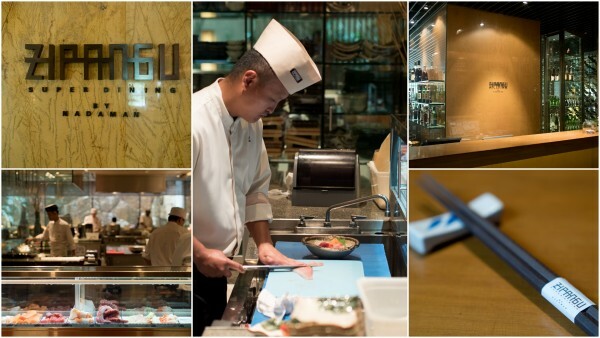 When it comes to Japanese restaurants, KL is spoiled for choices. Probably 80% of the hotels has an in house Japanese restaurant, there bound to be a place serving sushi at every shopping complex, and they are also represented in most newer commercial centers. It is then very easy to get lost in the conversation, and higher end Japanese restaurants often have to offer something unique to set themselves apart. Be it ambiance, ingredients, or experience. 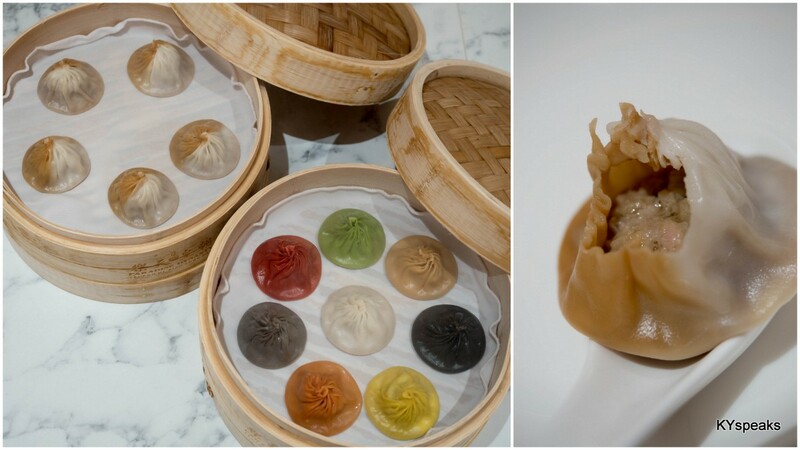 Personally, Zipangu at Shangri-La KL always have a special place in my heart as it was the restaurant where I first experienced foie gras back in 2007, as you would remember the first Kobe beef (at Elegantology), or the first ebiko (at Jusco Pyramid), first tempoyak (at Tenggol Island), etc. 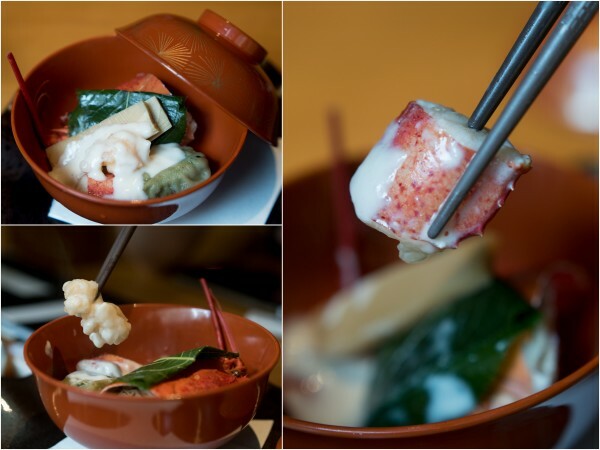 So when I had the opportunity to be sample the Early Spring Lobster Kaiseki at Zipangu, I agreed to it immediately. The six course menu is available from 15 to 31st March 2015, and priced at RM 280++ per person. 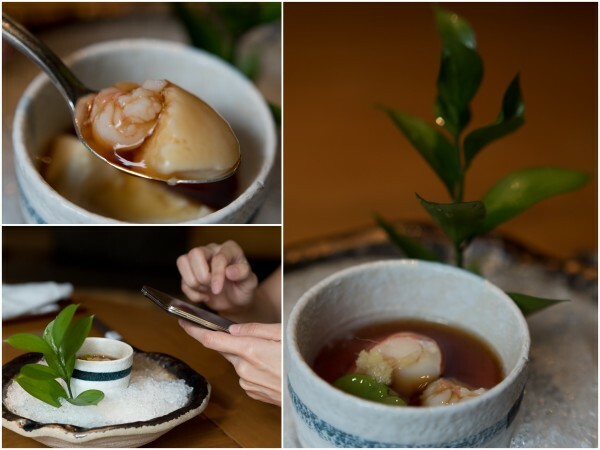 We started out with a dish that is visually very similar to chawanmushi, but what is usually made of steamed egg is instead chilled home-made soy milk tofu, with the topping of wasabi, sweet sticky sauce, and of course, lobster. The visual-almost-misrepresentation did not take away from the brilliance of the appetizer, it was simple yet elegant. The second course was octopus with field mustard and soba noodle. Another light dish showcasing not only seafood, but also the vegetables of the season in Japan. I particularly like the addition of bamboo shoots. No Kaiseki is complete without some raw ingredients. For this we have sashimi with salmon, lobster, and seabream. 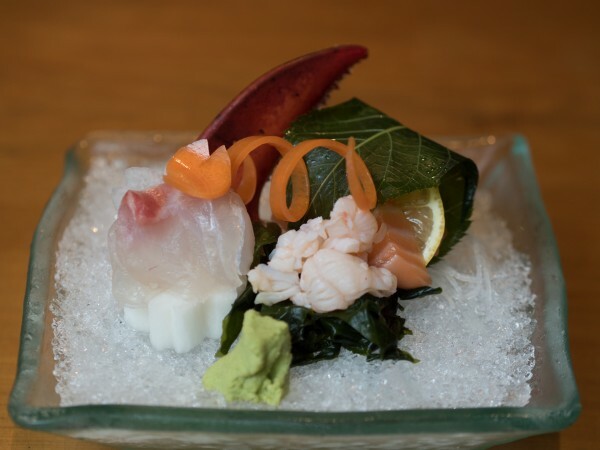 If you haven’t had lobster sashimi before, I urge you to give it a try, it is one of my favorite raw seafood ever, in fact, I think it is the best way to enjoy lobster. The soya sauce is mixed with lemon in this instance to give it an even fresher feel. I really enjoyed this. The meal then turn up the heat just a bit with the next serving being a hot dish of lobster and seasonal vegetable with salted fish cream sauce. The star of this dish is the cream sauce, as explained by our server, it is actually made from Bonito fish gut. It was subtle yet you can definitely feel its presence, sort of like how having Natalie Portman sitting at a quiet corner would make an impact to a room. 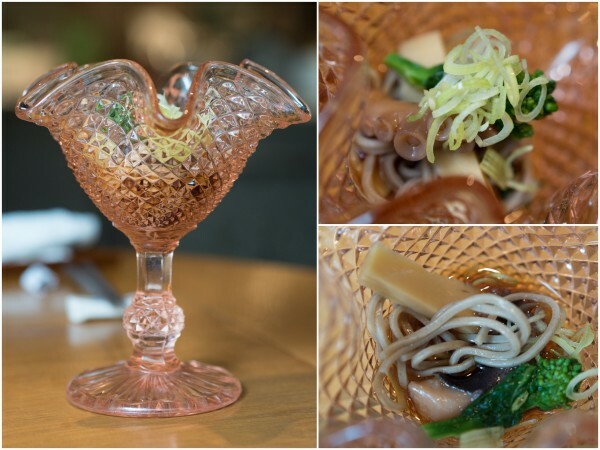 The next dish took a departure from seafood to honor another Japan’s famous ingredient – Wagyu beef. 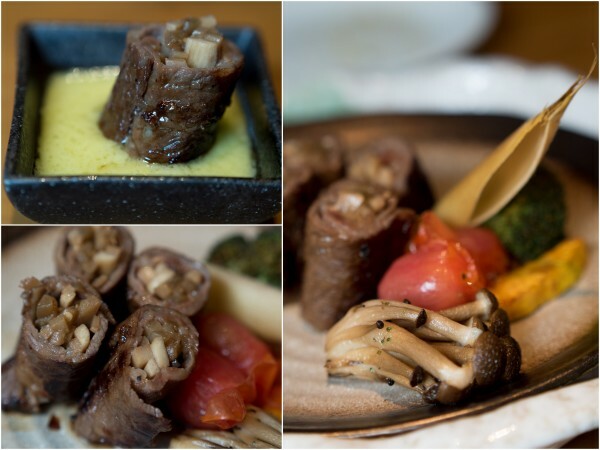 The good chefs at Zipangu simply called this Sliced Wagyu Beef Sukiyaki Roll. It was stuffed with mushroom and other seasonal vegetables grilled with perfection. Dip the roll in raw egg infused sukiyaki inspired sauce, and you have an implosion of richness with savory overdose. It was really satisfying. The fried rice tasted rather muted at first, but with the accompanying pickles, it suddenly became balanced and, well, good! The lack of salt/soya sauce in the rice was to make way for the pickles, this was the first time I had fried rice this way, though the concept isn’t totally unfamiliar to me since you have onigiri served in similar fashion as well. Panna Cotta with Cherry Blossom Flavour ends the Early Spring Lobster Kaiseki dinner, an experience that is truly Japanese and executed perfectly at Zipangu. I really enjoyed this review and the walk from KLCC under hot sun to Shangri-La was definitely worth it. The menu only lasts till end of this month, so if you’re a lobster lover, don’t miss out.